Oakland Privacy Working Group page. A. DAC is the acronym for the Domain Awareness Center. The DAC is a "surveillance hub" for the Port and City of Oakland. It is supposed to integrate data from public and private cameras, license plate readers, sound recordings and other sensors into a mass surveillance system. A. The National Security Agency (NSA) believes privacy is dead. We'd like to believe it's still on life support and has a chance of recovery. Q. Won't DAC help stop crime? A. There is no solid evidence that mass surveillance such as being proposed by the DAC prevents crime - especially violent crime. This is a myth propagated by companies that want to sell DAC technologies to every city and town across the country, making bazillions in profits from your tax dollars to no effect. It is a myth that is eagerly lapped up by police and politicians who want to "do something" about crime instead of investing long-term in education and living-wage jobs, the real crime reduction strategies. Q. What's the problem with having a DAC? "Video surveillance is used to monitor our lives and to control our actions. Comprehensive monitoring is the most visible manifestation of the ubiquitous eye of the state, done under the guise of society's basic need for security. "The gaze of the cameras does not fall equally on everyone but on those who are predefined as potentially deviant, or through appearance and demeanor, are singled out by operators as un-respectable.... Surveillance will become a tool of injustice through the amplification of differential and discriminatory policing." "Even surveillance of legal activities can inhibit people from engaging in them. "A core purpose of all surveillance is social control... we are inhibited, chilled by the eye in the Internet watching. Giving agents of the state the ability to monitor our every move and keystroke, let alone having this information available to DHS, the FBI and the NSA forever is simply unacceptable. Q. How did the DAC project start? Q. How did it turn into something citywide, not just for the Port? A. We're not sure exactly. In June of 2009 City of Oakland representatives signed a document to "Explore the Development of a Joint Port-OPD-OFD-OES Domain Awareness Coordination Center" In September, the Federal government tentatively approved a grant to the Port for $2.9M to implement the Joint City/Port DAC. In July, 2010 the City Council approved the grant and in early 2012 the final documents were signed. Who made the decision to mutate the project from Port security to citywide surveillance is unclear. Ultimately the buck stops with ex-Mayor Quan and former City Manager Santana, who allowed the City of Oakland's proud progressive traditions to be trampled on with bribes of DHS money so that it could become a guinea pig for mass surveillance on an unprecedented scale. Q. How far along is the DAC project? A. In Oct. 2012, Oakland sent out a Request for Proposal (RfP) for Phase I. The project was awarded to SAIC, completed in Spring of 2013. Q. What did SAIC put together during Phase I? A. Computers, software and information feeds. What was contracted for was built at the City’s Emergency Operations Center at 17th & MLK. Q. What about phase II? A. In May, 2013, the Port of Oakland approved transferring "Port Security Grant" monies to fund Phase II of the DAC. In late July, the Oakland City Council approved receiving these funds (some $2M) and gave a sole source, non-bid contract to SAIC to implement Phase II. Q. Did anyone notice? Were there protests? Q. So SAIC built Phase II of the DAC? A. No. In August, 2013 City staff "discovered" that SAIC was involved or affiliated with nuclear weapons technology research or support. Q. Well, duh. Who didn't know that? They're a military contractor. So what? A. In 1992 the City Council passed an ordinance (http://tinyurl.com/n5jfdfq) restricting the City in its dealing with companies associated in certain fairly broad ways with nuclear weapons technology. Q. Did Oakland then junk the whole project? A. No. But the City decided they couldn't use SAIC. They also realized they couldn't go back and do an entire round of Requests for Proposal (RFP) for Phase II - they were in danger of timing out on the grant money if they went through the whole process again. City Manager Santana decided to ask the Council to give permission to choose a Phase II contractor from the set of four Phase I contractors whom they had rejected in favor of SAIC last year. Q. Why did you put "discovered" in scare quotes? Q. What happened to Santana's request? A. On November 19th, 2013 the City Council considered the matter. Some 70+ people signed up to speak against the DAC – again to no avail. The vote was 6-1 to approve the new procedure for hiring a Phase II DAC contractor. A. Santana chose Schneider Electric. This choice was presented to the City Council Public Safety Committee on Jan. 28, 2014; the vote was 3-0-1 to forward the recommendation to the City Council. It came before the Council on Feb. 18th. Q. So Schneider isn’t a nuclear contractor? A. Schneider claims it has no current nuclear contracts, only past ones. Based on Schneider’s claims Santana opined that Schneider was in conformance with the NFZO. Q. What happened on February 18th? A. After some 50 people spoke in one voice against the DAC - members of the Lighthouse Mosque eloquently expressing their fear of increased surveillance, the City Council discussed scaling back the system to only handle Port Security and emergencies, then voted 6-0-2 to postpone a decision until March 4th. We and our friends had finally made an impact. On March 4th, again after unanimous public opposition, the Council voted 5-4, Mayor Quan breaking the tie, in favor of a Port-restricted DAC. A. It morphed from a policy to be put together by City staff to an “Ad Hoc” committee, ultimately to being a formal City committee which has met every other week from May, 2014 through March, 2015. Q. So Oakland’s safe from spying til it’s approved? A. Absolutely not. Information about “Stingray”, a device the Oakland Police “have access to” has come to light. Stingray is a device that mimics a cell phone tower; your cell phone is fooled into communicating with it. A Stingray can “listen in” on every cell phone that is using a particular tower and locate all cell phones in range - wide-ranging, warrantless surveillance. http://tinyurl.com/lha42cq Shotspotter - a gunshot detection system – has been revealed as capable of listening in on random public conversations. A. We are researching filing a lawsuit around this and other matters. The City has refused all our Public Records requests regarding “Stingray.” It has refused our requests for contract docs between the City and Harris, the manufacturer (Harris is also a Nuclear Contractor in violation of the NFZO because it has contracts with the City). Q. Why does this all sound like the novel ‘1984’ ? A. Because it is! Orwell was just a few decades premature predicting when technology would realize his dystopian nightmare. Stingray is truly Big Brother watching and EBX has exposed the real intent in constructing the DAC: not for safety but for the stifling of dissent: http://tinyurl.com/p7wbrqk. Q. Who are you guys? Who wrote this? A. "Phase 1 included the Design/build that would include equipment, services and the key City systems' integration.” Whatever that means. What was contracted for was built at the City’s Emergency Operations Center at 17th & MLK. A. No. But the City decided they couldn't use SAIC any more. They also realized they couldn't go back and do an entire round of Requests for Proposal (RFP) for Phase II - they were in danger of timing out on the grant money if they went through the whole process again. City Manager Santana decided to ask the Council to grant her permission to choose a Phase II contractor from the set of four Phase I contractors whom they had rejected in favor of SAIC last year. A. Santana chose Schneider Electric. This choice was presented to the City Council Public Safety Committee on Jan. 28th; the vote was 3-0-1 to forward the recommendation to the City Council. it came before the Council on Feb. 18th. A. Googling “Schneider Electric” and “nuclear weapons” shows their involvement in such work. However Schneider claims these references are to past contracts, not current ones. Based on Schneider’s claims Santana opined that Schneider was in conformance with the NFZO. A. After some 50 people spoke in one voice against the DAC - members of the Lighthouse Mosque eloquently expressing their fear of increased surveillance, the City Council discussed scaling back the system to only handle Port Security and emergencies, then voted 6-0-2 to postpone a decision until March 4th. We and our friends, had finally made an impact. A. It morphed from a policy to be put together by City staff to an “Ad Hoc” committee and ultimately to being a formal City committee which met every other week from May through a final mtg Jan 8th. A. Absolutely not. Information about “Stingray”, a device the Oakland Police “have access to” has come to light. Stingray is a device that mimics a cell phone tower; your cell phone is fooled into communicating with it. A Stingray can “listen in” on every cell phone that is using a particular tower and locate all cell phones in range - wide-ranging, warrantless surveillance. http://tinyurl.com/lha42cq Shotspotter - a gunshot detection system – has also been revealed as being capable of listening in on random public and private conversations. A. We are researching filing a lawsuit around this and other matters. The City has refused all our Public Records requests regarding “Stingray.” It has refused our requests for contract docs between the City and Harris, the manufacturer (Harris is also a Nuclear Contractor in violation of the NFZO - it has contracts with the City). A. Because it is! Orwell was just a few decades premature predicting when technology would realize his dystopian nightmare. Stingray is truly Big Brother watching and EBX has exposed the real intent in constructing the DAC: the stifling of dissent: http://tinyurl.com/p7wbrqk. Q. Isn't privacy dead? Won't DAC help stop crime? A. The National Security Agency (NSA) believes privacy is dead. We'd like to believe it's still on life support and has a chance of recovery. As for crime, there is no solid evidence that mass surveillance such as being proposed by the DAC prevents crime - especially violent crime. This is a myth propagated by companies that want to sell DAC technologies to every city and town across the country, making bazillions in profits from your tax dollars to no effect. It is a myth that is eagerly lapped up by police and politicians who want to "do something" about crime instead of investing long-term in education and living-wage jobs, the real crime reduction strategies. Oakland for $2.9M to implement the Joint City/Port DAC. In July, 2010 the City Council approved the grant and in early 2012 the final documents were signed. Who made the decision to mutate the project from Port security to citywide surveillance is unclear. Ultimately the buck stops with Mayor Quan and former City Manager Santana, who allowed the City of Oakland's proud progressive traditions to be trampled on with bribes of DHS money so that it could become a guinea pig for mass surveillance on an unprecedented scale. A. In Oct. 2012, Oakland sent out a Request for Proposal to implement Phase I. The project was awarded to SAIC Corporation and completed in the Spring of 2013. A. After some 50 people spoke in one voice against the DAC - members of the Lighthouse Mosque eloquently expressing their fear of increased surveillance, the City Council discussed scaling back the system to only handle Port Security and emergencies, then voted 6-0-2 to postpone a decision until March 4th. We, and our friends, had finally made an impact. A. It has morphed from a policy to be put together by City staff to a “Blue Ribbon” committee to an “Ad Hoc” committee and ultimately to being addressed by a formal committee which is now meeting every other week. It was to be October, 2014 before the policy would be voted on. Q. So is Oakland safe from spying until October? A. The committee is still finalizing it. They’ve put together a strong policy, and we are following the committee’s actions closely. The committee and we hope to get it passed in City Council soon. Q. Why does this all sound like the novel '1984' ? "Even surveillance of legal activities can inhibit people from engaging in them." "A core purpose of all surveillance is social control... we are inhibited, chilled by the eye in the Internet watching." A. On November 19th, 2013 the City Council considered the matter. Some 70+ people signed up to speak against the DAC – again to no avail. The vote was 6-1 (McElhaney in the minority) to approve the new procedure for hiring a Phase II DAC contractor. Q. So Schneider isn’t involved in with nuclear weapons, as was SAIC? A. Unclear. If one Google’s “Schneider Electric” and “nuclear weapons” references to their involvement in such work are readily apparent. However Schneider claims these references are to past contracts, not current ones. Based on Schneider’s claims the City Administrator wrote a memo opining that Schneider was in conformance with the NFZO and should be awarded the contract. A. After some 50 people spoke in one voice against the DAC, with members of the Lighthouse Mosque in particular eloquently expressing their fear of increased surveillance, the City Council discussed scaling back the system to only handle Port Security and emergencies, then voted 6-0-2 to postpone a decision for two weeks until March 4th. We, and our friends, had finally made an impact. A. It has morphed from a policy to be put together by City staff to a “Blue Ribbon” committee to an “Ad Hoc” committee and ultimately to being addressed by a formal committee whose membership is still being decided. It may be October before anything is created and voted on. Q. So Oakland is safe from spying until October at the very least? A. We are researching filing a lawsuit around this and other matters – contracting with SAIC in violation of the Nuclear Free Zone Ordinance for one. The City has so far refused all our Public Records requests regarding “Stingray.” It has refused our requests for contract docs between the City and Harris, the manufacturer (Harris is also a Nuclear Contractor in violation of Oakland’s ordinance because it has contracts with the City). Q. Why does it all sound like the novel '1984' ? Oakland for $2.9M to implement the Joint City/Port DAC. In July, 2010 the City Council approved receiving those monies and spending them. In early 2012 the final documents were signed. Why it took so long and who made the decision to mutate the project from Port security to citywide surveillance is unclear. 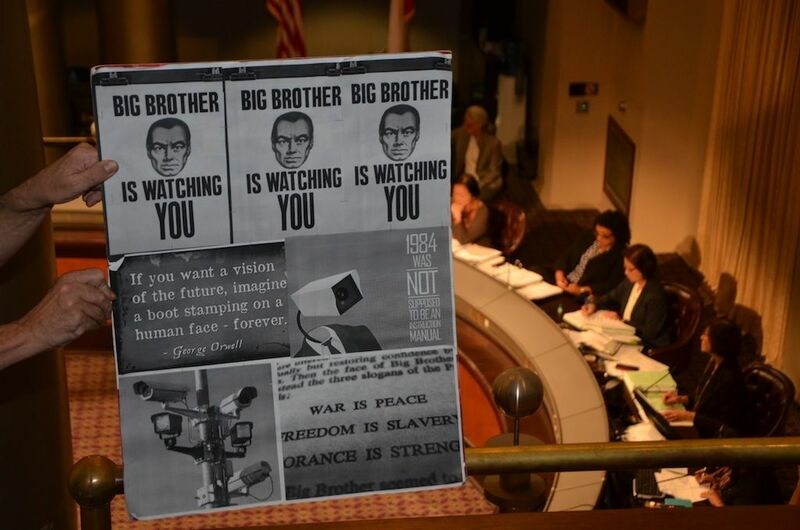 Ultimately the buck must stop with Mayor Quan and City Administrator Santana, who allowed the City of Oakland's proud progressive traditions to be trampled on with bribes of DHS money so that it could become a guinea pig for mass surveillance on an unprecedented scale. A. In October, 2012, Oakland sent out a Request for Proposal to implement Phase I. They ultimately chose Science Applications International Corporation (SAIC) from a number of bidders. That work, Phase I, was completed in late Spring of 2013. A. "Phase 1 included the Design/build that would include equipment, services and the key City systems' integration." For what that jumble is worth. In other words we’re not sure. What was contracted was built at the City’s Emergency Operations Center at 17th & MLK. A. In May, 2013, the Port of Oakland approved transferring "Port Security Grant" monies to fund Phase II of the DAC. In late July, the Oakland City Council unanimously approved receiving these funds (some $2M) and gave a sole source, non-bid contract to SAIC to implement Phase II with that money. Q. So Phase II is being implemented? A. No! A. At some point in August, 2013 City staff "discovered" that SAIC was involved or affiliated with nuclear weapons technology research or support. A. In 1992 (after a 1988 law was found unconsti-tutional), the City Council passed an ordinance (http://tinyurl.com/n5jfdfq) restricting the City in its dealing with companies associated in certain fairly broad ways with nuclear weapons technology. A. No. We don't know what kind of discussions went on after this "discovery," (we are issuing Public Records requests to find out) but what we do know is that the City decided they couldn't use SAIC any more. They also realized they couldn't go back and do an entire round of Requests for Proposal (RFP) for Phase II - they were in danger of timing out on the grant money if they went through the whole process again. City Manager Santana decided to ask the City Council to grant her permission to choose a Phase II contractor from the set of four Phase I contractors whom they had rejected in favor of SAIC last year. A. It’s questionable. We’re looking into this and many other areas for legal challenges. Also, Research by Darwin BondGraham (http://tinyurl.com/qhnl5ny) suggests that all of the four eligible contractors - to one degree or another - have a connection to nuclear weapons technology. Q. Why did you put "discover" in scare quotes? Q. What happened to Santana's request? A. On November 19th, 2013 the City Council considered the matter. Some 70+ people signed up to speak against the DAC. However City Council President Kernighan summarily rejected a request to move the agenda item up the schedule. Nonetheless some 30 people stayed and many of them voiced their objections around 1:00 AM - again to no avail. The vote was 6-1 (Councilperson McElhaney in the minority) to approve the new procedure for hiring a Phase II DAC contractor. A. The City Administrator had to choose one of four contractors, get approval from the Council and negotiate some sort of contract with that entity. Santana chose Schneider Electric. This choice was presented to the City Council Public Safety Committee on Jan. 28th; the vote was 3-0-1 to forward the recommendation to the City Council. it came before the Council on Feb. 18th. A. After some 50 people spoke – in one voice against the DAC, the City Council discussed scaling back the system to only handle Port Security and emergencies, then voted 6-0-2 to postpone a decision on the contract for two weeks. We made an impact! What will ultimately happen remains to be seen. Q. What can we do if Schneider is approved? A. We're the Oakland Privacy Group. We came together to fight the DAC and, more generally, all privacy and 4th amendment violations by our police-state government. Q. Do you have a website? Meetings? We’ll be at the City Council on March 4th. A. DAC is the acronym for the Domain Awareness Center. The DAC is a “surveillance hub” for the Port and City of Oakland. It is supposed to integrate data from public and private cameras, license plate readers, sound recordings and other sensors into a mass surveillance system. Q. Isn’t privacy dead? Won’t DAC help stop crime? A. The National Security Agency (NSA) believes privacy is dead. We’d like to believe it’s still on life support and has a chance of recovery. As for crime, there is no solid evidence that mass surveillance such as being proposed by the DAC prevents crime - especially violent crime. This is a myth propagated by companies that want to sell DAC technologies to every city and town across the country, making bazillions in profits from your tax dollars to no effect. It is a myth that is eagerly lapped up by police and politicians who want to “do something” about crime instead of investing long-term in education and living-wage jobs, the real crime reduction strategies. Q. What’s the problem with having a DAC? “Video surveillance is used to monitor our lives and to control our actions. Comprehensive monitoring is the most visible manifestation of the ubiquitous eye of the state, done under the guise of society’s basic need for security. Giving agents of the state the ability to monitor our every move and keystroke, let alone having this information available to DHS, the FBI and the NSA forever, is simply unacceptable. A. We’re not sure exactly. In June 2009, City of Oakland representatives signed a document which called for a group to “Explore the Development of a Joint Port-OPD-OFD-OES Domain Awareness Coordination Center at the City’s existing Emergency Operations Center (EOC).” In September, the Federal government tentatively approved a grant to the Port of Oakland for $2.9M to implement the Joint City/Port DAC. In July 2010, the City Council approved receiving and spending those monies. In early 2012 the final documents were signed. Why it took so long, and who made the decision to mutate the project from Port security to citywide surveillance, is unclear. Ultimately the buck must stop with Mayor Quan and City Administrator Deanna Santana, who allowed the City of Oakland’s proud progressive traditions to be trampled on with bribes of Homeland Security money so that it could become a guinea pig for mass surveillance on an unprecedented scale. A. “Phase 1 included the Design/build that would include equipment, services and the key City systems’ integration.” For what that jumble is worth. In other words, we’re not sure. What was done was built at the City’s Emergency Operations Center at 17th & MLK. A. In May, 2013, the Port of Oakland approved transferring “Port Security Grant” monies to fund Phase II of the DAC. In late July, the Oakland City Council unanimously approved receiving these funds (some $2,000,000) and gave a sole source, non-bid contract to Phase I contractor SAIC to implement Phase II with that money. Q. So Phase II is being implemented? A. We don’t know exactly. At some point in August 2013, City of Oakland personnel “discovered” that SAIC was involved or affiliated with nuclear weapons technology research or support. Q. Well, duh. Who didn’t know that? They’re a military contractor. So? A. In 1992 (after a 1988 ordinance was found unconstitutional), the Oakland City Council passed an ordinance restricting the City in its dealing with companies associated in certain fairly broad ways with nuclear weapons technology. A. No. We don’t know what kind of discussions went on after this “discovery” (we are issuing Public Records requests to find out), but we do know the City decided they couldn’t use SAIC any more. They also realized they couldn’t go back and do an entire round of Requests for Proposal (RFP) for Phase II - they were in danger of timing out on the grant money if they went through the whole process again. City Manager Santana decided to ask the City Council to grant her permission to choose a Phase II contractor from the set of four Phase I contractors whom they had rejected in favor of SAIC last year. A. It’s questionable. We’re looking into this and many other areas for legal challenges. Also, research by Darwin BondGraham suggests that all of the four eligible contractors - to one degree or another - have a connection to nuclear weapons technology. Q. Why did you put “discover” in scare quotes? A. Because we procured documents (using a California Public Records Act request) that show that SAIC and officials in City government knew in February, 2013 that SAIC was performing work in violation of the ordinance. The East Bay Express has published an exposé detailing how SAIC perjured itself and City officials were complicit in the cover-up. Q. What happened to Santana’s request? A. The City Administrator had to choose one of four contractors and negotiate some sort of contract with that entity. Santana chose Schneider Electric. This choice was presented to the City Council Public Safety Committee on Jan. 28th, and is scheduled to come before the full City Council on Feb 18th. A. Section 526a of the California Civil Code allows taxpayers to challenge a City on illegal use of funds. We think this is the case and are putting together the grounds for a lawsuit. As our first step we submitted a “Cease and Desist” letter to Oakland before the Jan. 28th meeting. Help us out here. Q. Why does it all sound like the novel ‘1984’? A. Because it is! Orwell was just a few decades premature in predicting when technology would realize his dystopian nightmare. The EBX has exposed the true intent of City personnel in constructing the DAC: the stifling of dissent. A. We’re the Oakland Privacy Group. We came together to fight the DAC and, more generally, all privacy and 4th amendment violations by our police-state government. We’ll be at the City Council on Feb. 18th. A. “Phase 1 included the Design/build that would include equipment, services and the key City systems’ integration.” For what that jumble is worth. In other words we’re not sure. What was done was built at the City’s Emergency Operations Center at 17th & MLK. Q. So Phase II is being implemented?A. No! A. We don’t know exactly. At some point in August, 2013 City of Oakland personnel “discovered” that SAIC was involved or affiliated with nuclear weapons technology research or support. A. In 1992 (after a 1988 ordinance was found unconstitutional), the Oakland City Council passed an ordinance (http://tinyurl.com/n5jfdfq) restricting the City in its dealing with companies associated in certain fairly broad ways with nuclear weapons technology. A. No. We don’t know what kind of discussions went on after this “discovery,” (we are issuing Public Records requests to find out) but what we do know is that the City decided they couldn’t use SAIC any more. They also realized they couldn’t go back and do an entire round of Requests for Proposal (RFP) for Phase II - they were in danger of timing out on the grant money if they went through the whole process again. City Manager Santana decided to ask the City Council to grant her permission to choose a Phase II contractor from the set of four Phase I contractors whom they had rejected in favor of SAIC last year. A. It’s questionable. We’re looking into this and many other areas for legal challenges. Q. What happened to Santana’s request?A. On November 19th, 2013 the City Council considered the matter. Some 70+ people signed up to speak against the DAC prior to the meeting’s beginning at 6:30. When the meeting began, City Council President Kernighan summarily rejected a request to move the agenda item up the schedule, refusing to even call a vote of the Council on the question. Nonetheless some thirty people stuck around and many of them voiced their objections around 1:00 AM - again to no avail. The Council voted 6-1 (Councilperson McElhaney in the minority) to approve the new procedure for hiring a Phase II DAC contractor. Protesters also “mic checked” the Council about two hours into the meeting, demanding to be heard on the DAC before exhaustion set in. Again, that was refused. A. The City Administrator had to choose one of four contractors and negotiate some sort of contract with that entity. Santana chose Schneider Electric. This choice will be presented to the City Council Public Safety Committee on Jan 28th, and is tentatively scheduled to come before the full City Council on Feb 4th. A. Not true! If one Google’s “Schneider Electric” and “nuclear weapons” it is painfully obvious that SE is a nuclear weapons contractor. In fact research by Darwin BondGraham (http://tinyurl.com/qhnl5ny) suggests that all of them - to one degree or another - have a connection to nuclear weapons technology. Whether these ties to nuclear weapons render them ineligible under the terms of the 1992 ordinance, and whether if so the City of Oakland will choose to ignore the links, or seek an exemption, remains to be seen. Q. Can a decision by the City to ignore such a connection be challenged? A. Section 526a of the California Civil Code allows taxpayers to challenge a City on illegal use of funds. We think this is the case and are beginning to put together the grounds for a lawsuit. Q. Why does it all sound like the novel ‘1984’ ? Q.Isn’t privacy dead? Won’t DAC help stop crime? A. The National Security Agency (NSA) believes privacy is dead. Just ask Edward Snowden. We’d like to believe it’s still on life support and has a chance of recovery. As for crime, there is no solid evidence that mass surveillance such as being proposed by the DAC prevents crime - especially violent crime. This is a myth propagated by companies that want to sell DAC technologies to every city and town across the country, making bazillions in profits from your tax dollars to no effect. It is a myth that is eagerly lapped up by police and politicians who want to “do something” about crime instead of investing long-term in education and living-wage jobs, the real crime reduction strategies. Q.What’s the problem with having a DAC? Q.How did it turn into something citywide, not just for the Port? Q.How far along is the DAC project? Q.What did SAIC put together during Phase I? Q.Did anyone notice? Were there protests? Q.So Phase II is being implemented? Q.Well, duh. Who didn’t know that? They’re a military contractor. So? A. No. We don’t really know what kind of discussions went on after this “discovery,” (we are issuing Public Records requests to find out) but what we do know is that the City decided they couldn’t use SAIC any more. They also realized they couldn’t go back and do an entire round of Requests for Proposal (RFP) for Phase II - they were in danger of timing out on the grant money if they went through the whole process again. City Manager Santana decided to ask the City Council to grant her permission to choose a Phase II contractor from the set of Phase I contractors whom they had rejected in favor of SAIC last year. A. It’s questionable. We’re looking into this and other areas for legal challenges. Q.Why did you put “discover” in scare quotes? *A. On November 19th, 2013 the City Council considered the matter. Some 70+ people signed up to speak against the DAC prior to the meeting’s beginning at 6:30. When the meeting began, City Council President Kernighan summarily rejected a request to move the agenda item up the schedule, refusing to even call a vote of the Council on the question. Nonetheless some thirty people stuck around and many of them voiced their objections around 1:00 AM - again to no avail. The Council voted 6-1 (Councilperson McElhaney in the minority) to approve the new procedure for hiring a Phase II DAC contractor. Protesters also “mic checked” the Council about two hours into the meeting, demanding to be heard on the DAC before exhaustion set in. Again, that was refused. A. The City Administrator must choose one of four contractors (presumably one that is still willing…), negotiate some sort of contract, and come back to the City Council in January, 2014 for them to approve of her choice. That could happen at their Jan 7th meeting, or the next one on the 21st. As of this printing (1/2) no contractor selection announcement has been made. Q.These previously rejected contractors aren’t involved in with nuclear weapons, as was SAIC? A. Research by Darwin BondGraham (http://tinyurl.com/qhnl5ny) suggests that all of them - to one degree or another - have a connection to nuclear weapons technology. Whether they each have strong enough ties to nuclear weapons to render them ineligible under the terms of the 1992 ordinance, and whether if so the City of Oakland will choose to ignore such connections, or seek an exemption, remains to be seen. Q.Can a decision by the City to ignore such a connection be challenged? Q.Why does it all sound like the novel ‘1984’ ? Q.Who are you guys? Who wrote this? Q.Do you have a website? Meetings? Q. So what? Isn’t privacy dead? Won’t the DAC help stop crime? Giving authoritarian agents of the state the ability to monitor our every move and keystroke, let alone have it all available to Homeland Security and the NSA is simply unacceptable. A. We’re not really sure. In June of 2009 City of Oakland representatives signed a document which called for a group to “Explore the Development of a Joint Port-OPD-OFD-OES Domain Awareness Coordination Center at the City’s existing Emergency Operations Center (EOC).” In September, the Federal government tentatively approved a grant to the Port of Oakland for $2.9M to implement the Joint City/Port DAC. In July, 2010 the City Council approved receiving those monies and spending them. In early 2012 the final documents were signed. Why it took so long and who made the decision to mutate the project from Port security to citywide surveillance is unclear. Q. What exactly did SAIC build or create during Phase I? A. “Phase 1 included the Design/build that would include equipment, services and the key City systems’ integration.” For what that jumble is worth. A. In 1992 (after a 1988 ordinance was found unconstitutional), the Oakland City Council passedan ordinance barring the City from contracting with companies associated in certain fairly broad ways with nuclear weapons technology or support. A. No. We don’t really know what kind of discussions went on after this “discovery,” but what we do know is that the City decided they couldn’t use SAIC any more. They also realized they couldn’t go back and do an entire round of Requests for Proposal (RFP) for Phase II, because they were in danger of timing out on the grant money if they went through the whole RFP process again. City Manager Santana decided to ask the City Council to grant her permission to choose a Phase II contractor from the set of Phase I contractors whom they had rejected in favor of SAIC last year. A. We don’t know. We’re not legal experts. A. Because we procured documents (using a California Public Records Act request) that show that SAIC and officials in City government knew in February, 2013 that SAIC was performing work in violation of the ordinance. The East Bay Express justpublished an expose detailing how SAIC perjured itself and City officials were complicit in the cover-up. Q. What happened to Santana’s proposal at City Council? A. On November 19th, the City Council considered the matter. (It was actually on November 20th, because it was after midnight before they got to it.) Some 70+ people signed up to speak against the DAC prior to the meeting’s beginning at 6:30. When the meeting began, City Council President Kernighan summarily rejected a request to move the agenda item up the schedule, refusing to even call a vote of the Council on the question. Nonetheless some thirty people stuck around and many of them voiced their objections - again to no avail. The Council voted 6-1 (Councilperson McElraney in the minority) to approve the new procedure for hiring a Phase II DAC contractor. Protesters also “mic checked” the Council about two hours into the meeting, demanding to be heard on the DAC before exhaustion set in. Again, that was refused. A. The City Administrator must choose one of the five or six contractors (presumably one that is still willing…) and come back to the City Council in January, 2014 for them to approve of her choice. We believe that will happen at their January 7th meeting. Q. These previously rejected contractors aren’t involved in some way with nuclear weapons, as was SAIC? A.Research by Darwin BondGraham suggests that all of them - to one degree or another - have a connection to nuclear weapons technology. Whether they each have strong enough connections to nuclear weapons to render them ineligible under the terms of the 1988 ordinance, and whether if so the City of Oakland will choose to ignore such connections, remains to be seen. A. We’re not sure. We’re looking into it. Q. Why does it all sound like the novel ‘1984′ ? A. Because it is! Orwell was just a couple decades premature in his predictions of technological capability. A. We’re the Oakland Privacy Group. We came together to fight the Domain Awareness Center and, more generally, all privacy and 4th amendment violations by our police-state government. A.Here’s a wiki page about Oakland’s DAC. Our meetings should be listedhere andhere. There’s also a twitter account:@oaklandprivacy.